When you hear “green,” you think of leaves, trees, grass and maybe even salad. When you hear “red,” you picture a heart or a flower. 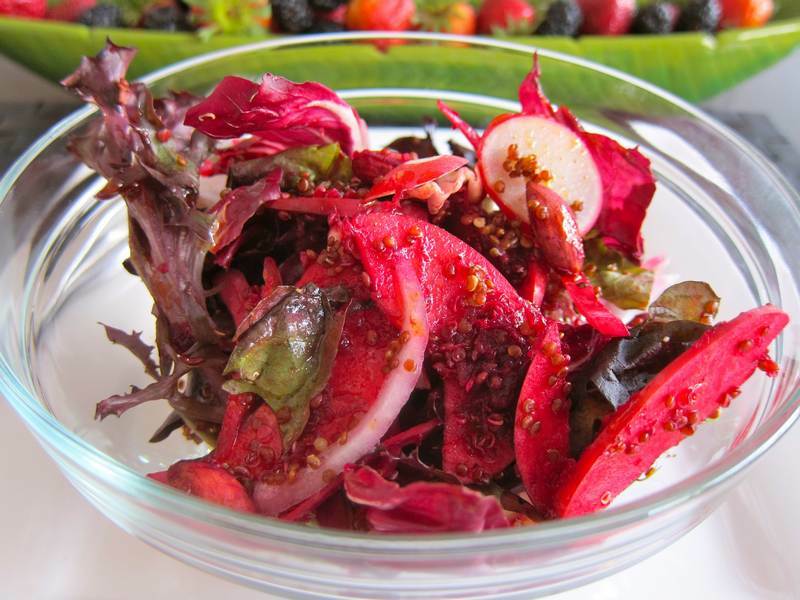 The idea of a red salad catches us off guard, grabs our attention, forces us to reconsider our preconceived notions. 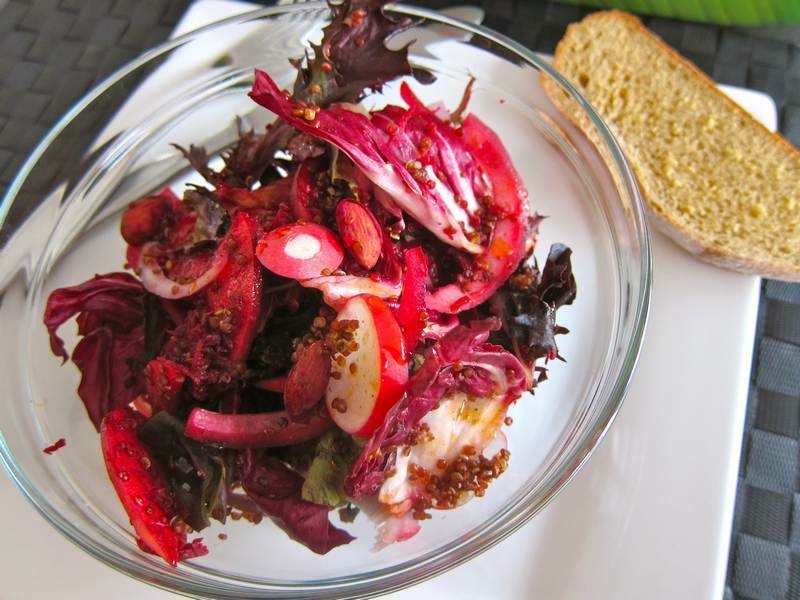 So, the next time you are in the mood for a provocative salad that stimulates the brain and your taste buds, try this Red Salad L’Orignal, named for the Restaurant L’Orignal in Old Montreal with a red salad on their spring menu. That’s ” l’orignal,” French for moose, not a typo, although the red salad recipe is original, too. In a large bowl, combine the grated beet, almonds, quinoa and apple. Stir gently to coat. 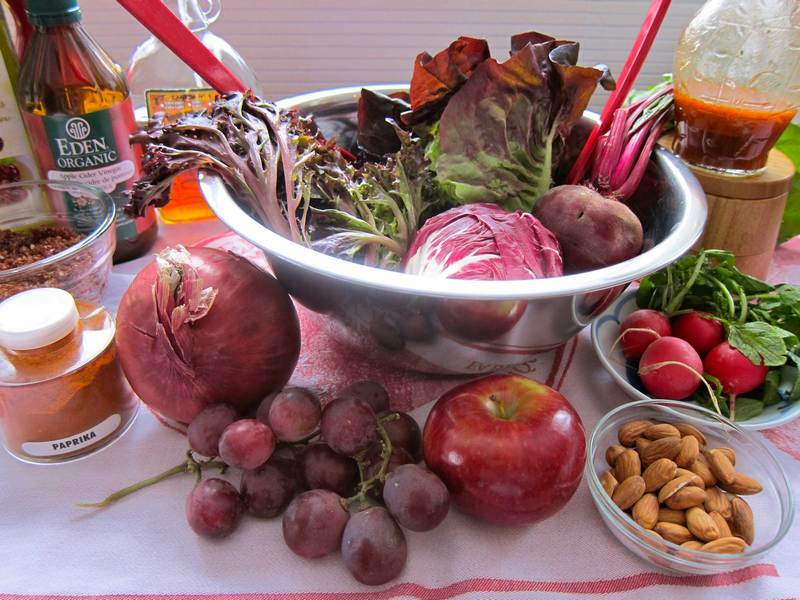 Distribute the other ingredients into 4-6 portions, adding the beet mixture to each potion. Combine all the dressing ingredients. Taste test to adjust seasoning. Divide dressing by drizzling a tablespoon portion over each salad. Serve the remainder of the dressing on the side or in a plate for dipping toasted kamut bread, from Boulangerie le Fournil. 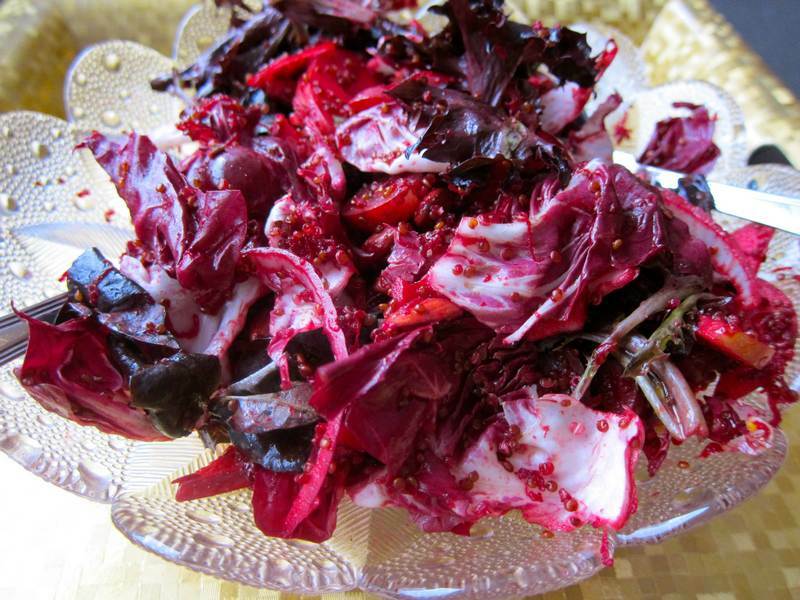 Thanks to my snow-covered-mountain-loving friend, George Stern, of the amazing bead emporium Frabels, for sharing his red salad from Restaurant L’Orignal. A meal out with friends is wonderful and really worthwhile if you head on home with a new delicious recipe. Did you know that 30 percent of the unfrozen land on earth is devoted to livestock, mostly cows, and that the biggest harm to our environment comes from their appetite and methane gas emissions? Apparently if we all give up meat and dairy just 1 day per week, we can go a long way towards remediating this environmental disaster. Listen to this 2 part Freakonomics You Eat What You Are podcast. And read Vanity Fair’s ‘Steak Show’s it’s Muscle’, by A. A. Gill. What do you know about cuisine de terroir? Between Appetite for Books‘ talk, “Cook it Raw with Alessandro Porcelli,” and the wonderful cuisine de terroir menu at L’Orignal, I’m starting to get the point. Can’t wait for the pink salad! A pink salad does sound interesting. I’ll mull it over. Just wanted to mention that my son who hates beets loves this salad. And, I had a wee bit of salad left over, added 3 more cooked beets, splashed on a little more dressing, threw in some parsley and coriander…He loves that too. So, I guess Red Salad L’Orignal is a beet game changer. Looking forward to hearing how you like this after trying it out. fantastic! I love colorful meals! This is very creative. Thanks! I am addicted to colour too. I figure the more colourful the healthier. Something tells me we’d enjoy virtually dining together!